This is not an economy tire! - The IRC tire offers many of the same performance features as the Michelin, and uses a slightly harder side wall compound to reduce the potential for punctures. 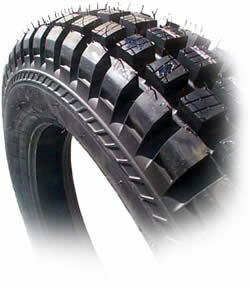 Radial design has a dual-rubber compound. A softer rubber is used for the tread, and a harder rubber is used to increase the strength of the sidewalls giving the tire incredible grip and handling capabilities. If you're a rider that experiences frequent punctures, then the IRC is a great alternative. 2.75" x 21" Tubeless 2ply, radial design.